Avis Lease, an operating lease service for the Indian corporate sector. All services offered in Avis Lease have been designed by the company keeping the unique requirements of the Indian corporate. Avis has been present in India for over 12 years and is an industry leader in quality and reliability of services. The company‟s investment in technology, processes and systems enables it to provide an unmatched international experience. T o spearhead its leasing business Avis has appointed Mr Karunesh Arya as its Chief Operating Officer (Leasing) . He has over 19 years of experience in managing businesses related to auto finance, car rentals and leasing. “We plan to position operating lease as a lifestyle solution wherein the executive enjoys the use of an excellently maintained car with a comprehensive set of conveniences and services included at a low monthly pay-out. Our iconic Avis Red Carpet Lease offers features like fleet advisory, vehicle acquisition, insurance, repairs & maintenance, stay new plan, accident management, vehicle up-gradation, 24X7 road side assistance, replacement vehicle, field technician support and vehicle disposal” said Mr Arya. Operating Lease enables corporate houses to offer its executives the convenience of uninterrupted mobility coupled with a high degree of personalized service in a tax efficient manner without investing in assets not core to its business. Premium Lease – A flexible operational lease which offers vehicle acquisition, maintenance, insurance and road-side assistance as standard services. The customer also has the option to add on other desired services. Fleet management services – A management only package for corporations with their own fleet who desire professional maintenance, insurance & road side assistance services from experts. “As the number one luxury car manufacturer in India, BMW India congratulates Avis India on the launch of its leasing business in India. On behalf of BMW Group India, I would like to wish Avis India success in all its upcoming endeavors. With the launch of Avis Lease, we look forward to create unparalleled experiences for our esteemed clientele in India.” said Dr Andreas Schaaf, President, BMW Group India while congratulating Avis India. Avis in India is a one-stop shop for all car rental needs with Safety, Quality, Timely Service delivery & Customer Delight as some of its important benchmarks. Avis in India offers chauffeur and self-drive services across a wide range of cars including Economy Segment Cars (Toyota Etios or similar), Mid Segment (Honda City or similar), Premium Segment (Toyota Corolla, Toyota Camry, Mercedes E & S class) and MUV/SUV‟s. Avis India, the international car rental company in the country has launched Avis Lease, an operating lease service for the Indian corporate sector. All services offered in Avis Lease have been designed by the Company keeping in mind the unique requirements of the Indian corporate. The flagship product of Avis Lease is the unique Red Carpet Lease which for the first time in India offers a comprehensive and high quality operating lease solution. Besides theRed Carpet Lease, Avis India will also offer other services like Premium Lease, Fleet Consultancy & Fleet Management. Avis has been present in India for over 12 years and is an industry leader in quality and reliability of services. The company‟s investment in technology, processes and systems enables it to provide an unmatched international experience. To spearhead its leasing business Avis has appointed Karunesh Arya as its Chief Operating Officer (Leasing). He has over 19 years of experience in managing businesses related to auto finance, car rentals and leasing. “We plan to position operating lease as a lifestyle solution wherein the executive enjoys the use of an excellently maintained car with a comprehensive set of conveniences and services included at a low monthly pay-out. Our iconic Avis Red Carpet Lease offers features like fleet advisory, vehicle acquisition, insurance, repairs & maintenance, stay new plan, accident management, vehicle up-gradation, 24X7 road side assistance, replacement vehicle, field technician support and vehicle disposal” said Arya. Rs 950 crore for adding 8,000 cars into its fleet in the upcoming 3-4 years. The firm also unveiled car leasing service aimed at corporate clients that will be having 7,000 vehicles in the next 3-4 years for Rs 700-crore investment. It will also provide an overall service package in the model - Red Carpet Lease - that will consist insurance, maintenance and other needs of the vehicles. For the new business venture, the company has decided to hire 100 people and presently employs 350 people. The American car rental company, Avis is planning to expand its Indian business with an investment of Rs. 700 crore for executing rental services for the corporate sector. The CEO of Avis India, Sunil Gupta remarked that corporate leasing in the country like India will surely and quickly pick up demand in the coming time and therefore the brand like Avis is moving into the same. He further stated, “The concept of starting a lease service for the corporate sector in India is developing and many major MNCs and significant corporate giants are entering into the same for hiring cars on lease instead of buying. As per specifications, corporate firms buy around 10% of the total cars sold in the country and out of that, only 10% of the cars are leased. So, up till now only a fraction of the leasing potential is explored in India and the potential for growth is huge.” In coming next three to four years, Avis India is planning to invest in the country and will be purchasing 7,000 cars on operating lease. The car rental company is still looking for the best offers in terms of its operating lease business. 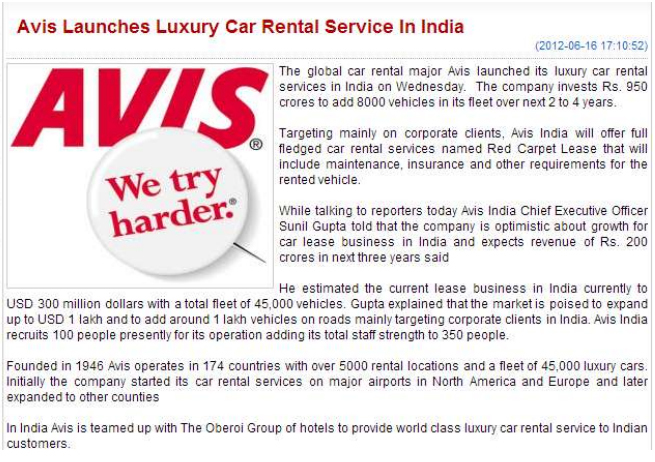 Avis with its car rental business is present in India since 12 years. Operating lease business basically assists corporate houses in offering their clients and executives the convenience of uninterrupted mobility along with qualitative professional services. Furthermore these personalized services are tax efficient and don‟t push the companies in investing in such assets, which are not core to their business needs. Avis India, the leading International Car Rental Company in the country has launched Avis Lease, an operating lease service for the Indian corporate sector. All services offered in Avis Lease have been designed by the Company keeping in mind the unique requirements of the Indian corporate. To spearhead its leasing business Avis has appointed Mr Karunesh Arya as its Chief Operating Officer (Leasing). He has over 19 years of experience in managing businesses related to auto finance, car rentals and leasing. “Our strong relationships with leading automobile manufacturers and insurance companies in India and our access to the best international practices in fleet management combine allow us to provide best in class operating lease services in the country.” Continued Mr Gupta Lease solutions include. Red Carpet Lease - A full service operational lease that offers customers a comprehensive mobility solution with value added services to offer a superior experience to customers. Premium Lease - A flexible operational lease which offers vehicle acquisition, maintenance, insurance and road-side assistance as standard services. The customer also has the option to add on other desired services. Fleet consultancy services - A unique service which advises corporations on fleet policies, fleet mix, fleet acquisition and disposal. Fleet management services - A management only package for corporations with their own fleet who desire professional maintenance, insurance & road side assistance services from experts. Avis India, the international car rental company in the country has launched Avis Lease, an operating lease service for the Indian corporate sector. All services offered in Avis Lease have been designed by the Company keeping in mind the unique requirements of the Indian corporate. The flagship product of Avis Lease is the unique Red Carpet Lease which for the first time in India offers a comprehensive and high quality operating lease solution. Besides the Red Carpet Lease, Avis India will also offer other services like Premium Lease, Fleet Consultancy & Fleet Management. Sunil Gupta, CEO, Avis India while speaking at the launch said "The concept of operating lease has been growing in India and major MNC and Indian corporate houses are moving towards taking cars on operating lease instead of buying. Corporate houses purchase around 10 percent of the total cars sold in the country and out of that, only 10 percent of the cars are leased. So far only a fraction of the leasing potential in India has been exploited and the potential for growth is huge. Avis India plans to invest Rs 7 Billion over the next 3-4 years in placing 7000 vehicles on operating lease." Avis has been present in India for over 12 years and is an industry leader in quality and reliability of services. The company's investment in technology, processes and systems enables it to provide an unmatched international experience. To spearhead its leasing business Avis has appointed Karunesh Arya as its Chief Operating Officer (Leasing). He has over 19 years of experience in managing businesses related to auto finance, car rentals and leasing. Mr Sunil Gupta, CEO, Avis India while speaking at the launch said "The concept of operating lease has been growing in India and major MNC and Indian corporate houses are moving towards taking cars on operating lease instead of buying. Corporate houses purchase around 10% of the total cars sold in the country and out of that, only 10% of the cars are leased. So far only a fraction of the leasing potential in India has been exploited and the potential for growth is huge. Avis India plans to invest Rs 7 Billion over the next 3-4 years in placing 7000 vehicles on operating lease." Avis has been present in India for over 12 years and is an industry leader in quality and reliability of services. The company's investment in technology, processes and systems enables it to provide an unmatched international experience. To spearhead its leasing business Avis has appointed Mr Karunesh Arya as itsChief Operating Officer (Leasing). He has over 19 years of experience in managing businesses related to auto finance, car rentals and leasing. "We plan to position operating lease as a lifestyle solution wherein the executive enjoys the use of an excellently maintained car with a comprehensive set of conveniences and services included at a low monthly pay-out. Our iconic Avis Red Carpet Lease offers features like fleet advisory, vehicle acquisition, insurance, repairs & maintenance, stay new plan, accident management, vehicle up-gradation, 24X7 road side assistance, replacement vehicle, field technician support and vehicle disposal" said Mr Arya. "As the number one luxury car manufacturer in India, BMW India congratulates Avis India on the launch of its leasing business in India. On behalf of BMW Group India, I would like to wish Avis India success in all its upcoming endeavors. With the launch of Avis Lease, we look forward to create unparalleled experiences for our esteemed clientele in India." said Dr Andreas Schaaf, President, BMW Group India while congratulating Avis India. Mr. Michael Perschke, Head, Audi India said "Audi India congratulates Avis India on the launch of Avis Lease, the premium operational lease service, in India today. Avis is well known for the reliability and quality of its services in India and I am sure Avis Lease will find acceptance by corporate clients in India. We, at Audi India, wish them the best and look forward to collaborate in future." Congratulating Avis India on its new initiative, Mr Peter Honegg, Managing Director & CEO, Mercedes Benz said "Avis has been a prestigious & strong fleet partner for us and we hope to strengthen our relationship with your new business initiative. We are certain that corporate customers will benefit from the high quality leasing solution on offer from Avis lease"
Avis in India has been a a one-stop shop for all car rental needs. With the launch of Avis lease the Company now offers the full bouquet of mobility solutions in the Indian market. The Oberoi Group operates 28 hotels and three cruisers in five countries under the luxury 'Oberoi' and five-star 'Trident' brands. For more information on The Oberoi Group, please visit www.oberoihotels.com. Updated: Mon, 18 Jun 2012 19:34 IST Car rental service provider Avis India today said it will invest Rs 950 crore to add 8,000 vehicles into its fleet over the next 3-4 years. The company today launched car leasing service, targeting corporate clients that will have 7,000 vehicles over the next 3-4 years for an investment of Rs 700 crore. "The market for operating lease is growing gradually. We plan to invest Rs 700 crore over the next 3-4 years to have 7,000 vehicle on operating lease business," Avis India Chief Executive Officer Sunil Gupta told reporters here. The company will offer an overall service package in the model -- Red Carpet Lease -- that will include insurance, maintenance and other requirements of the vehicles, he added. "From the leasing business, we expect a revenue of Rs 200 crore in the next three years," Gupta said, the company will launch the service in 7-8 prominent business cities. The company will also hire 100 people for this new business. Currently it employs 350 people, he added. According to Avis India, the operating leasing market in the country currently stands at around USD 300 million with about 45,000 vehicles. "The market growing very strongly. In the next five years, it is likely to expand to USD 800 million to USD 1 billion and about 1 lakh vehicles may ply in this business," Gupta said. Talking about its other models, he said the company is expanding its existing fleet size in the next 3-4 years. "Currently we are operating 1,500 cars and we will add 1,000 more vehicles at an investment of Rs 250 crore. We also want to expand our presence from 19 cities to more places ," Gupta said. When asked about mode of funding its investment, he said it will be done through equity and debt. Gupta said Avis India is aiming for a turnover of Rs 300 crore by 2014-15 from about Rs 150 crore, which is expected in this fiscal. 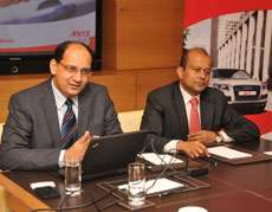 PRLog (Press Release) - Jun 18, 2012 – Avis India, the leading International Car Rental Company in the country has launched Avis Lease, an operating lease service for the Indian corporate sector. All services offered in Avis Lease have been designed by the Company keeping in mind the unique requirements of the Indian corporate. • Premium Lease - A flexible operational lease which offers vehicle acquisition, maintenance, insurance and road-side assistance as standard services. The customer also has the option to add on other desired services. • Fleet management services - A management only package for corporations with their own fleet who desire professional maintenance, insurance & road side assistance services from experts. The Oberoi Group operates 28 hotels and three cruisers in five countries under the luxury „Oberoi‟ and five-star „Trident‟ brands. For more information on The Oberoi Group, please visit www.oberoihotels.com. • Fleet consultancy services - A unique service which advises corporations on fleet policies, fleet mix, fleet acquisition and disposal • Fleet management services - A management only package for corporations with their own fleet who desire professional maintenance, insurance & road side assistance services from experts. To spearhead its leasing business Avis has appointed Mr Karunesh Arya as itsChief Operating Officer (Leasing). He has over 19 years of experience in managing businesses related to auto finance, car rentals and leasing. “We plan to position operating lease as a lifestyle solution wherein the executive enjoys the use of an excellently maintained car with a comprehensive set of conveniences and services included at a low monthly pay-out. Our iconic Avis Red Carpet Lease offers features like fleet advisory, vehicle acquisition, insurance, repairs & maintenance, stay new plan, accident management, vehicle up-gradation, 24X7 road side assistance, replacement vehicle, field technician support and vehicle disposal” said Mr Arya. Mr. Michael Perschke, Head, Audi India said “Audi India congratulates Avis India on the launch of Avis Lease, the premium operational lease service, in India today. Avis is well known for the reliability and quality of its services in India and I am sure Avis Lease will find acceptance by corporate clients in India. We, at Audi India, wish them the best and look forward to collaborate in future.” Congratulating Avis India on its new initiative, Mr Peter Honegg, Managing Director & CEO, Mercedes Benz said “Avis has been a prestigious & strong fleet partner for us and we hope to strengthen our relationship with your new business initiative. We are certain that corporate customers will benefit from the high quality leasing solution on offer from Avis lease” Avis in India has been a a one-stop shop for all car rental needs. With the launch of Avis lease the Company now offers the full bouquet of mobility solutions in the Indian market. Fleet management services A management only package for corporations with their own fleet who desire professional maintenance insurance road side assistance services from experts. As the number one luxury car manufacturer in India BMW India congratulates Avis India on the launch of its leasing business in India. On behalf of BMW Group India I would like to wish Avis India success in all its upcoming endeavors. With the launch of Avis Lease we seem forward to create unparalleled experiences for our esteemed clientele in India. said Dr Andreas Schaaf President BMW Group India while congratulating Avis India. Mr. Michael Perschke Head Audi India said Audi India congratulates Avis India on the launch of Avis Lease the premium operational lease service in India today. Avis is well known for the reliability and quality of its services in India and I am sure Avis Lease will find acceptance by corporate clients in India. We at Audi India wish them the best and look forward to cooperate in future. Avis in India is a one-stop shop for all car rental needs with Safety Quality Timely Service delivery Customer Delight as some of its important benchmarks. Avis in India offers chauffeur and self-drive services along a wide range of cars including Economy Segment Cars (Toyota Etios or similar) Mid Segment (Honda City or similar) Premium Segment (Toyota Corolla Toyota Camry Mercedes E S class) and MUV/SUV s.